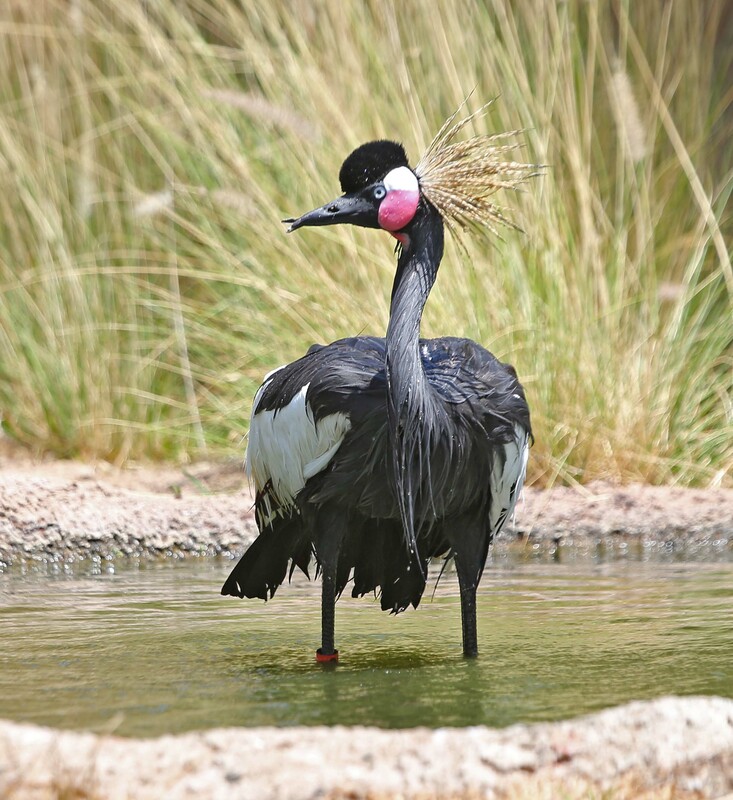 The Black Crowned Crane, also known as the West African Crowned Crane) is an Africa bird that is closely related to the Grey Crowned Crane. 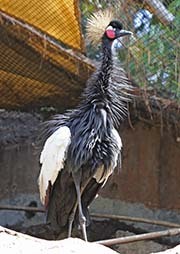 There are two subspecies of Black Crowned Cranes; the West African Crowned Crane (Balearica pavonina pavonina) and the Sudan Crowned Crane (Balearica pavonina ceciliae). 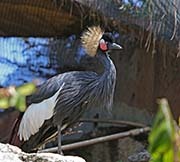 These cranes are mostly black and dark grey with white upper and under wing coverts. 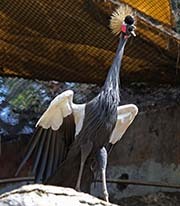 They have a distinctive golden colored spiky crest, red and white cheek patches, a red gular sac, and black legs and feet. The main difference between the subspecies is the extent of the red patch on the cheek. Sexes are similar in each subspecies but the male tends to be a bit larger. Juveniles are mostly black with the upper body feathers rufous edged and the lower body feathers are sandy buff colored. The nape is brown. Because of loss of habitat, hunting, and pesticides this species is in decline and is listed as 'Vulnerable' by the IUCN. Diet: Like all cranes, it feeds on grasshoppers, flies, millipedes, crabs, amphibians and reptiles, grass seeds, cultivated grain crops. Courtship: The Black Crowned Crane has a display that involves dancing, bowing, running, jumping and stick tossing. This display is believed to be part of the courtship ritual and may also reinforce the pair bond. Younger birds also 'dance' and the reasons for this may be to help with motor development and to relieve aggression and tension. 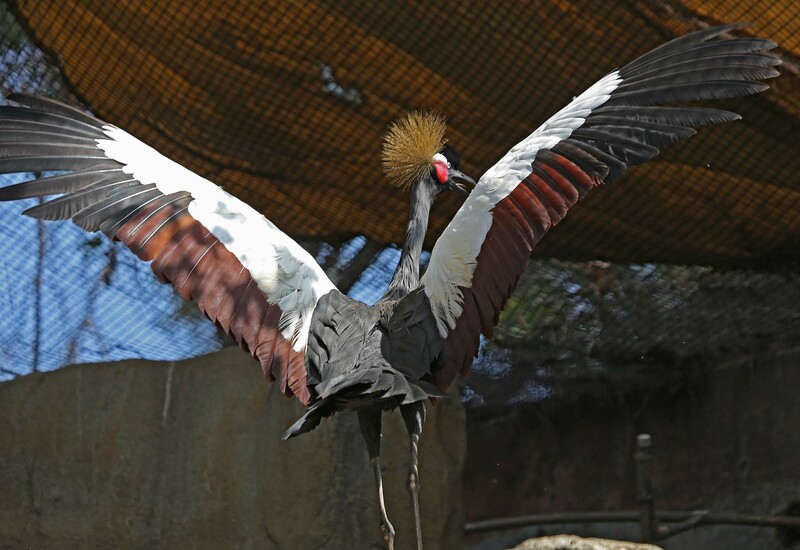 Black Crowned Cranes are monogamous birds that pair for life. Pairs will stay together even in the middle of a large flock. Nesting: Black Crowned Cranes build a circular nest platform of grasses and sedges within or along vegetated wetlands or in trees. The female lays 2-5 eggs. The chicks are precocial and hatch with down feathers, open eyes and can leave the nest soon after hatching. Both parents guard the nest from predators. 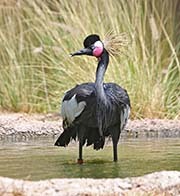 Habitat and Range: Both species are found in sub-Saharan Africa. is found from Senegal and Gambia to Lake Chad. is found from Chad to Sudan, Ethiopia and Kenya. Both subspecies prefer freshwater marshes, wet grasslands and the edges of lakes, ponds and rivers. Vocalization: The main vocalization is a booming call where the crane will inflate the gular sac underneath its chin and push the air out. This calling is done with the head laid against the top of the neck and then tilted back. 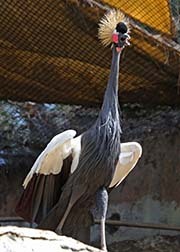 The crane also produces peculiar honks that are quite different from the loud, bugling calls of other crane species that have much longer coiled tracheas. Plumage/Molt Like most cranes, molts annually during the post-breeding season. The flight feathers are lost gradually so they do not experience an extended flightless period. 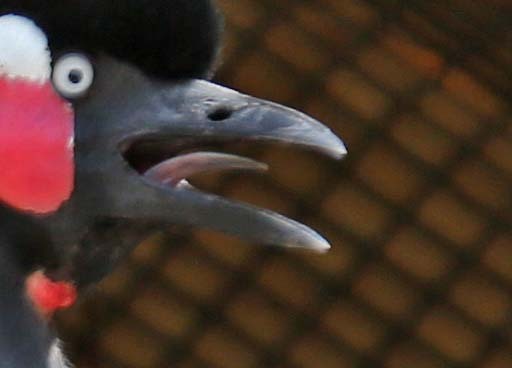 Migration: Black Crowned Cranes do not migrate. 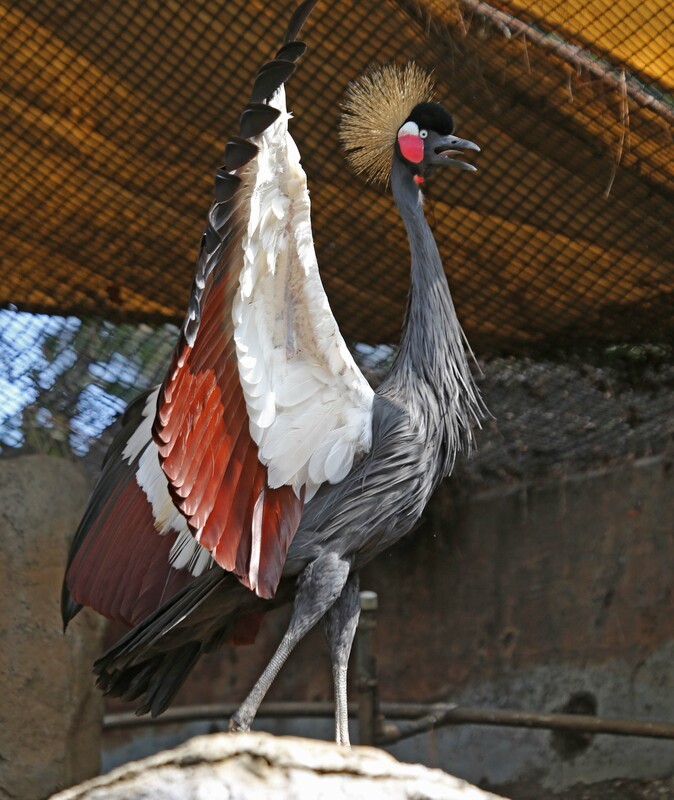 Tongue/feet: Black Crowned Cranes and Grey Crowned Crane are the only cranes that can roost in trees. They have a long hind toe which can grasp branches. 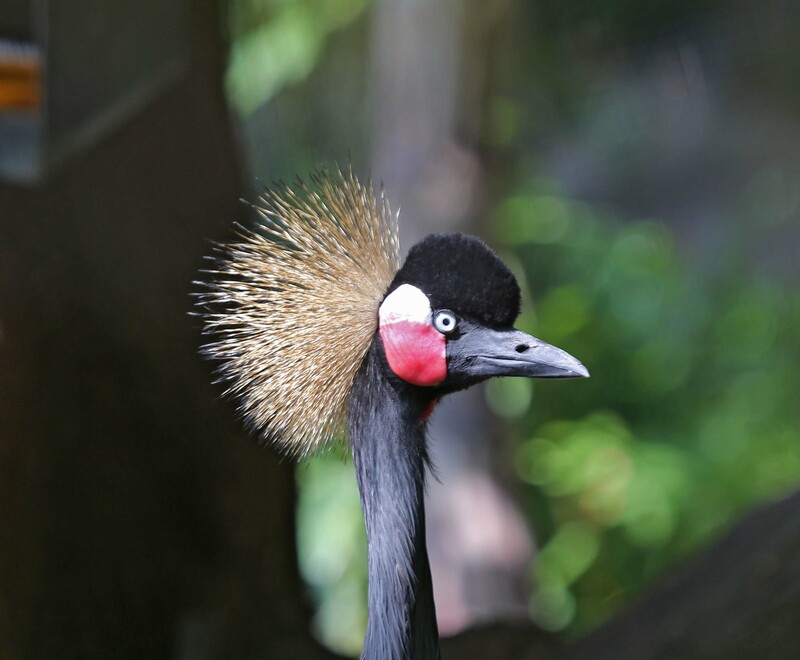 Note that some of the above picture show the Black Crowned Crane's tongue. It seems smooth, medium width and length.